Balancing the Sword would be incredibly useful even if it were entirely a Q&A study aid, but there is so much more. All of the 7,000 plus questions have cross references with the exception of 6 questions. The references will deepen your study. Truly, there is no greater book in all the world for assisting in the interpretation of the Bible than the Bible itself. In essence, the references turn every question into a small topical study. The cross references in the same book are listed in italics. By comparing various scriptures, we learn how to accurately divide "the word of truth" (2Ti. 2:15). 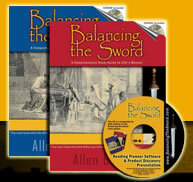 Thus, we learn to balance the Sword of the Spirit. The average question is supported by 7.6 references. When more than 10 references were available, the 10 most helpful references were used. There are a total of 53,896 chapter references with about 80 percent more verse references which means that reading all the references would be equal to reading the entire Bible through 3.1 times. References tie prophecies to their fulfillments, especially between the Old and New Testament. Some references target verses that parallel the same event in other books, and sometimes references are examples. Some references cite passages that reflect a similar thought or idea while others point to texts that state the opposite view. The references are now hyperlinked here at the BTS website. You can look up references as fast as you can click.